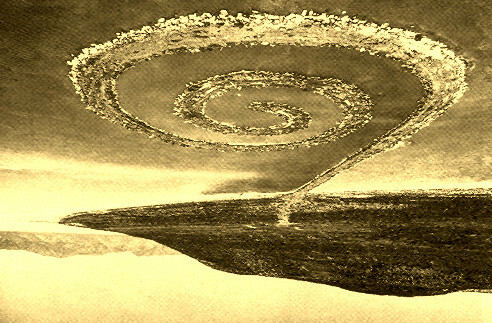 In response to my post about the "Desert Breadth", Kite_surfer, a prolific poster in Google Earth Community with many excellent posts to his credit, has brought to my knowledge another huge piece of art in the shape of an spiral. 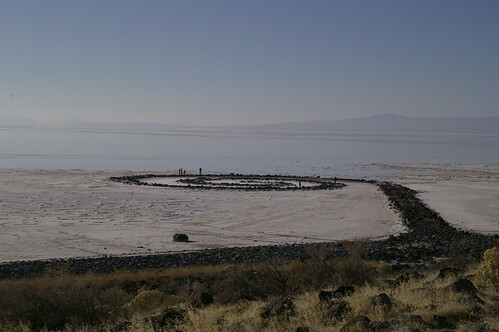 This earthwork sculpture created in 1970 by American sculptor Robert Smithson is known as "Spiral Jetty" and is located on the north-eastern shore of the Great Salt Lake near Rozel Point in Utah. It is made of mud, salt crystals, basalt rocks and earth. The coil of the spiral is about 457 metres long and 4.6 metres wide. Unfortunately it was constructed during draught period when the level of the lake was low hence it frequently gets submerged when the water level in the lake rises above elevation of 1280 metres. As a matter of fact soon after its construction it remained under water for almost 30 years. 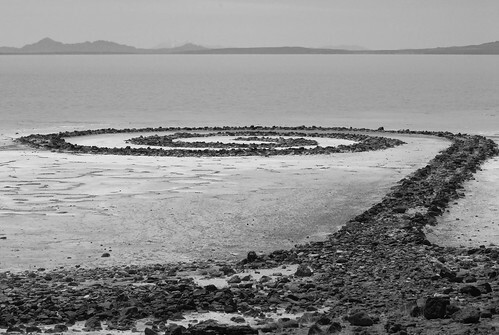 Nature and submergence for long duration in salt water has taken its toll and the spiral is decaying. Efforts to preserve it are under planning. Thank you for your nice comments. I had a look at Kentuck Knob. It looks great. I would solicit information/links to unusual/strange and/or beautiful places/structures for inclusion in this travelogue.